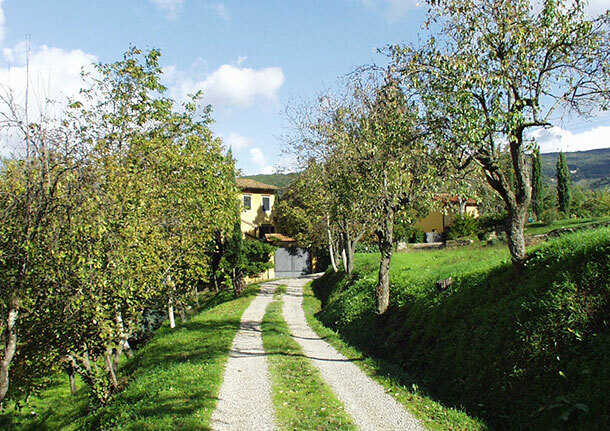 This is a small nucleus of buildings about 2 kms from the village of Rufina at 300m above sea level, in a panoramic position dominating the olive groves, the beautiful tuscan countryside and the well-known vineyards of the Frescobaldi family. Il Poggiolo consists of three detached houses, each with its own enclosed garden, independent access and maximum privacy; they have all been furnished with good taste and attention to detail and equipped with all the main comforts: satellite-TV, mosquito-netting on the windows of the bedrooms, hi-fi, wireless internet connection, furnished areas for dining outside, barbecue. In the area lying in front of the houses, guests can use the shared 6x12m swimming-pool, with deck-chairs, sun-beds and sun-shades available for everyone. The owners live in a fourth independent house on the edge of the complex. Annalisa, who is there mainly to look after guests, speaks english and is always available for any information you might need and to help you during your stay and can indicate the best restaurants in the area. Il Poggiolo lies about 22 kms from Florence, and from Rufina there is a train every hour that brings you to Florence central station in about 20 minutes, which is a good way to solve traffic and parking problems. Close by you can try wine in well-known vineyards that produce excellent wine. GROUND FLOOR: basement with equipped kitchen and dishwasher. FIRST FLOOR (with access from external staircase): entrance, large double living-room with fireplace, with billiards table, 40-inch satellite-TV, video-recorder (there is a small collection of films and documentaries), hi-fi; 1 twin-bedroom; 1 double bedroom with shower and washbasin only (no WC); ante-bathroom and bathroom with 2 wash-basins and shower; large kitchen with balcony, equipped with oven and microwave oven, wood-burning oven, fridge/freezer with water- and ice-dispenser, washing machine. SECOND FLOOR: large entrance with wardrobe; 1 double bedroom, 1 twin bedroom with access to a panoramic terrace of 100 sq.m., bathroom with Jacuzzi shower. Private enclosed garden.